The penultimate house on our tour of Berkeley Square is a dwelling that, while designed by celebrated local architects and modern for its time, was rather nondescript. Perhaps what distinguished it more than anything is that it was home to one family for over 40 years. William Henry Davis was born in 1868 in Clinton, New York, just east of the origins of his neighbor Francis Eugene Bacon across the street at #24—a region more Midwestern in some minds than Eastern, and as such a major source of 19th- and early 20th-century Angelenos. Davis didn't wait until retirement to come west as his neighbor had, however—he was just a year old when his parents brought him to California. He grew up in Marysville, north of Sacramento, was graduated from Berkeley in 1890, and would have about as exemplary a life as a bourgeois American man whose lifespan was divided by the Gilded Age could have. He studied law in the Marysville offices of his father, Judge Edwin A. Davis, and worked for Governor Henry T. Gage (yet another upstate New Yorker) before becoming general counsel of the Pacific Mutual Life Insurance Company—the firm with the whale jumping out of the water in its television commercials today. The organization was founded by Leland Stanford in San Francisco the year of Davis's birth; in early 1906 it merged with Conservative Life of Los Angeles, a company counting esteemed West Adamsites Frederick H. Rindge and Dr. John R. Haynes among its directors. 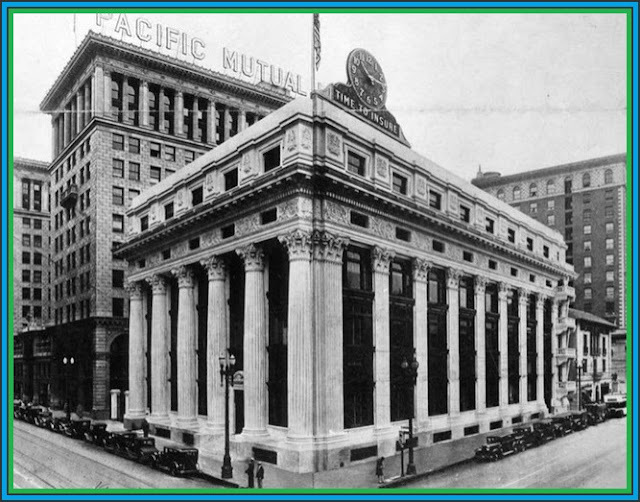 After the earthquake devastated its home offices up north just weeks after the merger, Pacific Mutual relocated its headquarters to Los Angeles, sending William Henry Davis along. on November 23, 1912. At right is 21 Berkeley Square, completed three years earlier. In 1896 William had married Berthe Samm, a native Iowan also brought to California as an infant. 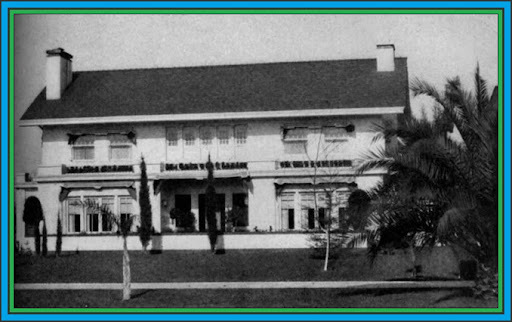 After settling in Los Angeles, they were among the first nontransient residents of the Hershey Arms at 2600 Wilshire Boulevard, opened in 1907; William's widowed father had also come down from up north to live with his son there. Even though they were at the time childless, and even though Edwin seems to have died by the time William and Berthe commissioned Sumner Hunt and Silas Burns to design their new house on Lot 14 in Berkeley Square, for some reason they decided that 6,000 square feet would be necessary so as not to be on top of each other. Perhaps they were hoping for more than their one child, Nadine, born in 1916. While they do not appear to have been at all aggressive socially, but rather quietly confident in such matters, the house, completed in early 1913, was no doubt meant to signify their status in the community—a bungalow certainly wouldn't do. 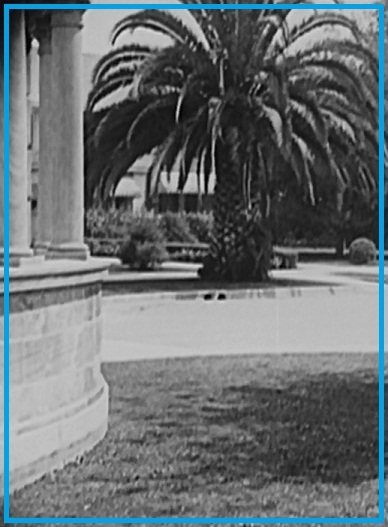 William belonged to a number of the best California clubs, including the California, the Los Angeles Athletic, and the Midwick and Los Angeles country clubs, and as well as the Bohemian in San Francisco and the Sutter in Sacramento. A burgher of the first order, Davis would rise to a vice-presidency of Pacific Mutual by 1917, and was one of the founding directors, along with Harry Chandler of the Times and producer-director Thomas Ince, of the Cinema Finance Corporation, capitalized at $2,000,000 to locally fund independent filmmakers. The usual entertainments took place at #25 over the years, and summers were often spent in Europe; Nadine grew up to attend Marlborough, and life was lovely until Berthe died suddenly of bronchial pneumonia at home on February 9, 1933, age 59. A sad turn of events, but rather than put #25 on the market, it seems that Bill Davis had in mind that the house might have a future within his own family. has been preserved. The Biltmore's south wall is seen at right. Generally speaking, steady habits within a family are passed from one generation to the next, and offspring are attracted to them. Nadine's apparently stable upbringing would result in her marriage in 1936 to the steady yet adventurous aviation man James S. Ricklefs, one of the most interesting men ever to live on the Square. In spite of their Los Angeles residency, there had always been a Northern California orientation to the Davises' life. Bill had a ranch, Toyon Farm, in Los Altos; Nadine was born not in L.A., but in San Francisco, and when she was 19 she married Stanford man Ricklefs, a native Iowan, like her mother. As a wedding present, Bill Davis gave the newlyweds—both were pilots—a set of wings. The Fairchild Model 24 made its first public appearance when the couple buzzed their own wedding reception at Toyon Farm; afterward they flew down the coast to spend their honeymoon at Del Monte Lodge. By this time Bill stayed mostly on his ranch up north; after an unsatisfying stint in the investment business in San Francisco, Jim's interest in aviation was to take him south—and so #25 became the Ricklefs house and would remain in the family until 1955. March 1915 issue of The Western Architect. 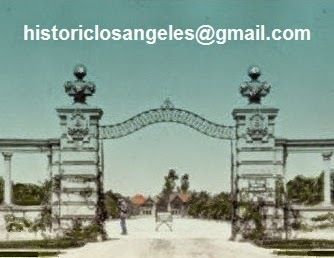 By 1940 Jim Ricklefs was at Northrop Aircraft in Hawthorne and living on the Square. He then taught aeronautical engineering at West Coast University before joining the fledgling Landgraf Helicopter Company in 1944. Wartime advances in aviation brought about the perfection of rotor-driven flight—and Ricklefs was front and center, a pioneer in the industry. By 1948 he was in business for himself, receiving government contracts to take surveying in Alaska, previously done with donkeys, to the much more efficient air, calling the business Rick Helicopters Incorporated. His success soon permitted him to open a 44,000-square-foot hangar at San Francisco International, and within five years, he had the world's largest chopper fleet (35) and had the biggest commercial charter operation of its type in the world in terms of gross revenue. He started his Rick Helicopter Maintenance Company with bases in both San Francisco and Los Angeles; the 340 miles between offices meant little to a man who was his own pilot. time since it was completed in 1914. In the midst of her husband's great success, Nadine was to die much too young; she was just 37 on her death in 1953. She left Jim with three young daughters, twins Naja Louise and Berte Marie, born in 1937, and Claire, born in 1945. The time had finally come for #25 to be sold. While the family was still listed there in late 1954 by the editors of the Los Angeles Blue Book and on voter rolls, by January the house was on the market and not long after passed into new hands. Melvin R. White was in residence at #25 by 1956 and appeared in city directories there through 1960; after that, the house can no longer be found in listings of any kind, and was soon to be reduced to elegant Hunt and Burns rubble. and restored it to flying condition in the 1980s. Jim Ricklefs returned to Northern California after leaving Berkeley Square, marrying Dorothy Major Van Horn in 1965 and remaining active in multiple pursuits—including, of course, aviation—into his 90s. Over the years he has supported and participated in many flying-related organizations and has restored a number of antique aircraft to flying condition, among them an example each of the World War I-era Spad Scout and Sopwith Pup. In the 1980s he found a particular treasure in a barn near his home—his own Honeymoon Fairchild. Somewhat worse for wear, it too was restored to perfection. If only houses and streets could similarly be brought back to life.